For companies that are based outside of "the film capital of the world", L.A. FOR HIRE gives you the inside track into Hollywood. Recognizing a divide between entertainment and media companies around the globe that are seeking Hollywood access, we created L.A. FOR HIRE to bridge this gap. 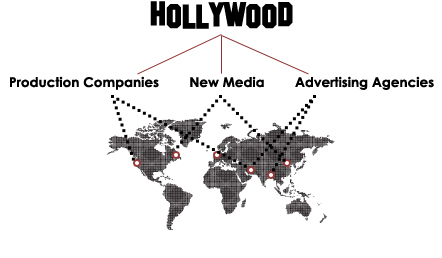 L.A. FOR HIRE is your "Hollywood Insider", providing you with expertise, consulting services and personal access to Hollywood agencies, studios, cable and TV networks, production companies and creative talent. Evaluating foreign films for Hollywood re-makes such as "The Ring", "The Departed", "Traffic" and "Mad Money"
With our insider knowledge and personal relationships, we know who to call ahead of time to get the real scoop. We leverage our insider knowledge to your advantage.